The art of Parkour or Free Running is a way of life, developing the body and mind. The philosophy of Free Running is to view the environment, urban or natural, and its obstacles as a series of challenges. You will learn from a Free Running pioneer to overcome these barriers with fluidity. You will be joining an elite group of athletes known as ‘Tracers’ (Free Runners) and will be racing against other Free Runners, to possibly become the greatest Tracer of all time. The challenges ahead require supreme physical strength and imagination. Have you got what it takes? More than 60 challenges spread over 10 different levels in 3 distinct zones, each with its own style of gameplay. Master over 50 moves, tricks and stunts including 'Kong Vaults', 'Pharaoh Climbs', 'Rail Split - Vaults' and 'Vertical Wall Runs' to be crowned the King of Parkour. 9 different challenge modes including ‘Race’, ‘Trick’ and ‘Target Collect’. Unlock new characters, clothes, tricks and music. Recreate your favorite Free Running moves and techniques. Game contents and software © 2009 - 2010 Rebellion. All rights reserved. 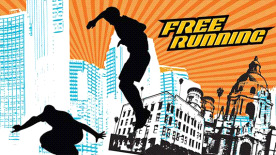 The Free Running logo is a trademark or registered trademark of Rebellion. All rights reserved. All other trademarks are property of their respective owners.